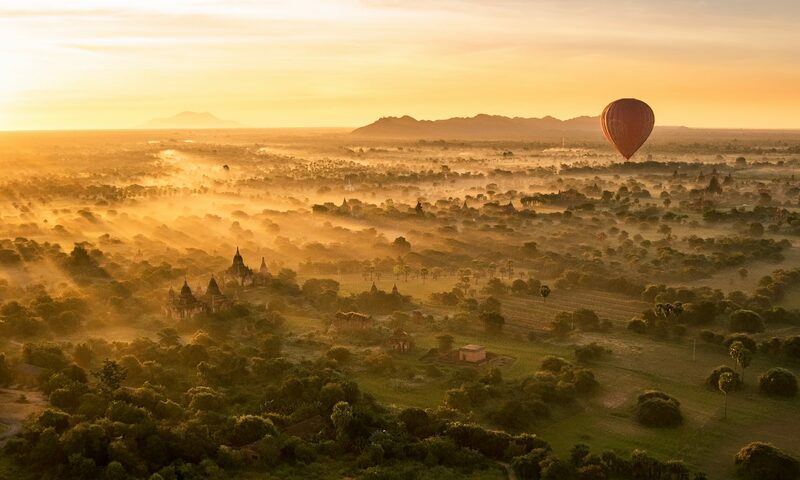 Travelling around Myanmar has become easier, and some would say safer, over the past few years as the number of tourists and domestic Airlines has grown. We travelled exclusively on Air KBZ flights throughout Myanmar, mainly because I could book online, from overseas, for flights almost a year in advance. Flights in Myanmar operate more like buses. They continuously run a certain route and you may have to stay on the plane for several “stops” before you reach your destination. Therefore, it’s important you board the correct plane, which may not be labelled with your destination (remember that the flight stops at several airports but the boarding signs will only note one, check the flight number carefully), and that you get off the plane at the right airport. We took a fairly typical route around Myanmar. Starting in Yangon (RGN) we first flew to Nyaung-U (NYU, serving the Bagan area), then to HeHo (HEH, serving Lake Inle), on to Thandwe (SNW, serving Ngpali) before returning to Yangon for an international connection. This may look like an inefficient route on the map, but it’s well served by the airlines and direct flights are available regularly along the various legs (meaning you don’t have to remain on the plane whilst other passengers board and unboard, along with their luggage, at other airports). Using well served routes also gives you some contingency for when, inevitably, flights are delayed. Having spent a few days in Yangon we headed to Yangon Airport (RGN) for our first domestic flight to Nyaung-U airport (NYU), which serves the Bagan area. At the time of flying, Yangon domestic terminal was housed in an older building next door to the brand new international terminal building. Check in was quick and efficient and it was the only flight for which we had printed board cards and seats allocated. We were also given a sticker each as once you have cleared security there are no departure boards. Instead, when a flight is due to board a member of the airline will walk around the departure lounge with the flight number written on a board, this is your cue to line up for boarding. There were a couple of occasions where some passengers had missed the call to board, this is where the stickers come in handy as each sticker identifies which flight you are due to be on. The ground crew simply walked around the departure lounge looking at the stickers to identify the tardy passenger. It was also reassuring to see other passengers with the same sticker as you still in departures – if you’re the only one left with your colour sticker, you’ve probably missed your flight. We had quite the collection of stickers by the end of the trip. The ground crew also manually transported checked bags to a small cart for loading on to the aircraft – no luggage belts here! The flight was delayed by about 20 minutes which was not a huge issue but a bit of an annoyance and added to the sense of uncertainty surrounding boarding. All of the planes were ATRs of various ages (propeller powered aircraft), but none were so old I was worried and all appeared well maintained. The crew were friendly, efficient and spoke moderately good english. Even though the flight was only 1 hour 20 minutes we were served a meal, which was a tasty fish paste roll along with a boiled sweet for landing and a slice of cake. The aircraft are single class, all economy, and the ticket cost approximately £100 per person. Baggage collection in Bagan was basically a room to which some porters bought the baggage on trollies then put in the middle of the room for people to collect. When you exit the baggage claim area right next the the exit of the terminal is a desk where you are required to buy a Bagan Archaeological Zone pass for 25,000 Kyats per person. The next flight we took was to HeHo (near Lake Inle) from Nyaung-U (NYU to HEH). Check in here was again very efficient, this time the luggage is weighed on a scale and a tag placed on the bags which are then stacked together in front/next the the check in desk, it felt a bit weird to do this especially if you are used to belts whisking away your luggage, that said we never had an issues. Again you collect your sticker and boarding card – this time it’s a hand written card as seen in the picture. The departure lounge in Nyaung-U is basic but air conditioned. There was little to no information available in the departures lounge and in fact our flight was 45 minutes late, with no communication from the airline to inform us of this. Once we were eventually up in the air we were again, despite the short flight time, provided a snack in the form of a a pastry. The cost of the flight was approximately £80 per person. Heho is the nearest airport to Lake Inle, which deserves a separate post, so look out for it. The drive from Heho to the hotel (Sanctum Inle) was about 1 hour and 15 minutes. We arranged transport through the hotel, which attracted a premium but took the hassle out of finding a taxi. On arrival we also had our first experience of immigration (even though this was a domestic flight) which was quick and efficient given the relatively small number of passengers. After a few days in Lake Inle our next destination was Ngpali, a beach resort. We flew in to Thandwe Airport (SNW), about a 15 to 20 minute drive from the beach where all the hotels are located. Check in again was efficient and similar to that at Nyaung-U. Departure at HeHo was a little more chaotic, there were a number of airlines with flights departing within minutes of each other meaning the departures lounge was busy and overcrowded. Our flight was delayed by about 30 minutes and again there was little information available. Due to the number of flights leaving at the same time I found you had to be especially vigilant to ensure you didn’t miss the call to board. You can see from the video how boarding works. The flight from Inle to Ngpali (HEH to SNW) cost approximately £95 per passenger. Again despite the short flight time we were provided with a small snack, this time a pastry with some kind of egg cake. Once we arrived in Thandwe we again had to go through immigration, this time with a longer queue. Bagage collection in Thandwe was interesting and were it not for the driver our hotel provided I would never of guessed you have to leave the main building, turn left, walk 50 metres, and collect your bags from a gate next to the carpark. You can see in the below photo where luggage collection is – it’s not marked or sign posted in anyway so far as we could see. Our final Domestic flight in Myanmar was the one that caused me the most concern. We had an international flight connection to make in Yangon and given the accuracy of departure times I had experienced so far, I was worried we might miss it. As such the day before we were due to fly I decided to move my flight an hour earlier, having no idea how well the KBZ customer service would be I chose to book the earlier flight using the website, then email to KBZ to cancel the original booking and get a refund. KBZ customer service was very efficient and replied almost immediately to confirm the cancellation and the 75% refund (which arrived in my bank account 2 weeks later – a hit I was willing to take to ensure the international connection). Thandwe airport is fairly new and there was building work still being carried out. There is a two story departure area here with a balcony upstairs however most passenger stayed downstairs as this was where the call to board was made. Again despite the short flight time we were provided with a snack this time a chicken sausage in a roll and a cake. This flight cost approximately £95 per person. The flight was again late in departing but my new booking would now allow us 3.5 hours between landing in Yangon domestic terminal and departing to Bangkok from the international terminal. When we arrived in Yangon airport late and waited what seemed like an age to collect our luggage I was glad we changed the flight time – I would recommend leaving more time than you would normally for connections due to the unreliability of the flights and inefficiencies in baggage collection in Myanmar. Once we had our luggage we then had to find the way to the correct part of the international terminal, a helpful taxi driver hoping to pick up some passengers knew exactly where we needed to go (out of the domestic arrivals building, turn left) and pointed it out to us. It was a 2 minute walk and once you are on the path its pretty hard to get lost. Overall my experience of domestic flights in Myanmar was a positive one, yeah you can pretty much guarantee every flight will be delayed by some amount of time (every single one of our flights was delayed) but it allowed us to travel great distances in a very short time meaning we made the most of the time we had available in the Country. Do I think we missed out of seeing the world pass us by on a train or bus, maybe, but if you have the budget and are limited by the time you’re spending in the country, I would absolutely recommend flying.